So if you don’t know I love baking! Kevin and I actually started a baking business! I get a lot of questions about how baking has affected my weight loss journey. I will definitely make a blog all about how I managed to bake and lose over 300 pounds! However, to somewhat answer that question I feel that it has really helped me grow as a baker. I am constantly trying out new recipes, and trying to make my favorite sweets “healthier.” I also love trying out other recipes and seeing what recipes from others that I love!!! So in that way, baking has definitely opened my eyes to trying to create and try healthier alternatives to treats! So when I came across this recipe I knew I had to try it! I mean I really love everything Skinny Fitalicious makes so I knew I probably couldn’t go wrong with this recipe, and I thought what better way than to try out this new recipe and make it for my mom for mothers day! My moms favorite cookie is an oatmeal cookie, and she LOVES strawberries! So I decided to make these cookies for her (and for myself too lets be honest). All I have to say is that these cookies definitely did not disappoint! So without further ado, lets get baking! 1. 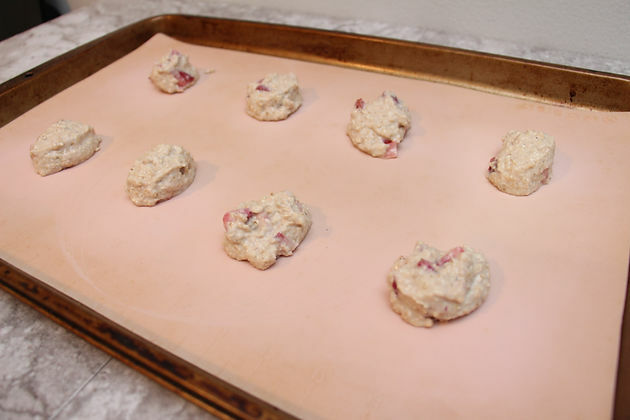 Heat the oven to 375 degrees F. Prepare a baking sheet with parchment paper. 2. In a blender or food processor, combine egg white, applesauce, lemon juice, Greek yogurt, salt, baking powder, baking soda, coconut sugar and oat flour. 3. 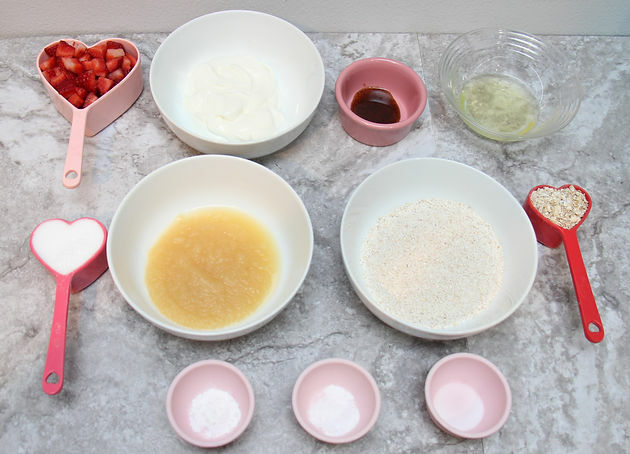 Blend until ingredients are fully combined then transfer the dough to a mixing bowl and carefully fold in the strawberries and oats. 4. Use an ice cream scoop to drop ~2 tbsp of batter onto the prepared baking sheet. 5. Bake 10 minutes until the edges of the cookies are just beginning to brown. 6. Remove from the oven, transfer to a wire rack to cool completely. 7. Keep cookies in a container in the refrigerator up to one week. I loved these cookies. But more importantly, my mom loved them too! They are full of flavor, and the fresh strawberries in them are so good! They are definitely a lot softer and do not get really crunchy like regular cookies, however the flavor is spot on! Next time I will definitely cut the strawberries a lot smaller, since they do release a lot of water and I think this added to the softness of the cookie. 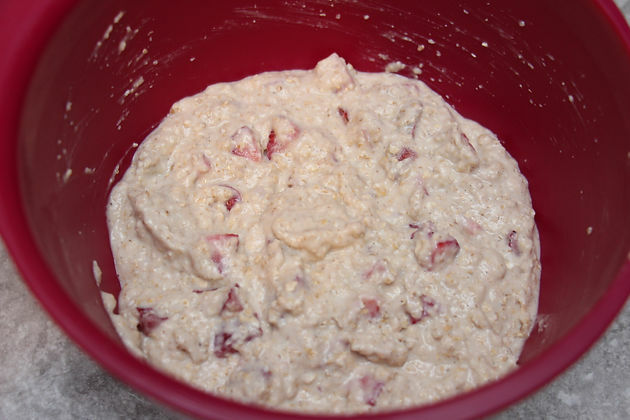 I also think for me personally I may play around with this and add some more oatmeal and maybe less liquid, just for a personal preference since I kind of enjoy a crunchier cookie. If you are looking for a healthier alternative to cookies, I would definitely try these out! 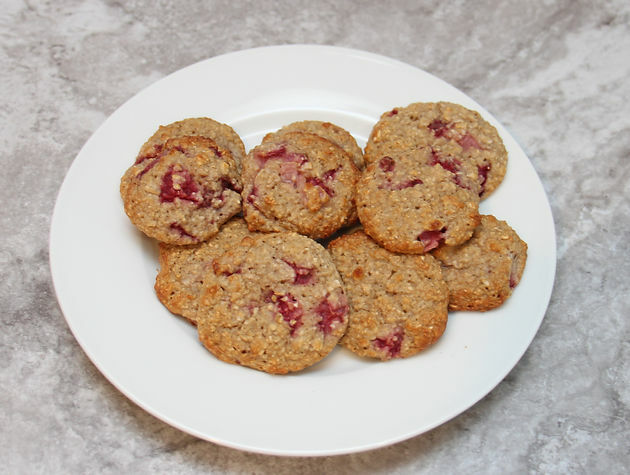 They are sweet, delicious and high in protein…they are also gluten free (if you use gluten free oats). I think these definitely satisfy a sweet tooth craving, as well as make a great breakfast since they do have protien, oats and fruit! A few of these with a cup of coffee and it would definitely get your day off to a great start! I will definitely be making these again and I am excited to play around with this and come up with some more variations to this great recipe! if you make these be sure to tag me in your pictures and let me know what you think! Also let me know your favorite sweet treat and I can definitely try and come up with a healthier alternative for you!